These questions have come up repeatedly over the years, and we have provided explicit answers for all of our users. HOW DO I enter medications for a student? HOW DO I set up protocol medications? 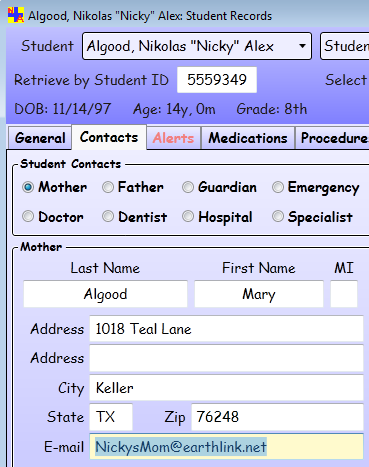 HOW DO I create templates for clinic visits? HOW DO I input screening results for a group of students? HOW DO I find students without screenings? 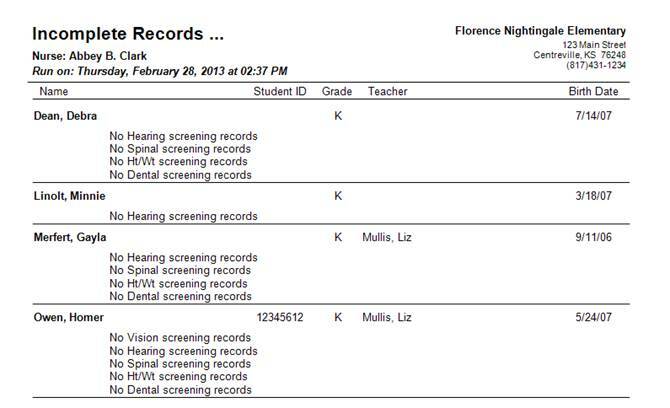 HOW DO I send out screening notices to a group of students? HOW DO I get screening results and reports? HOW DO I send out immunization notices to a group of students? 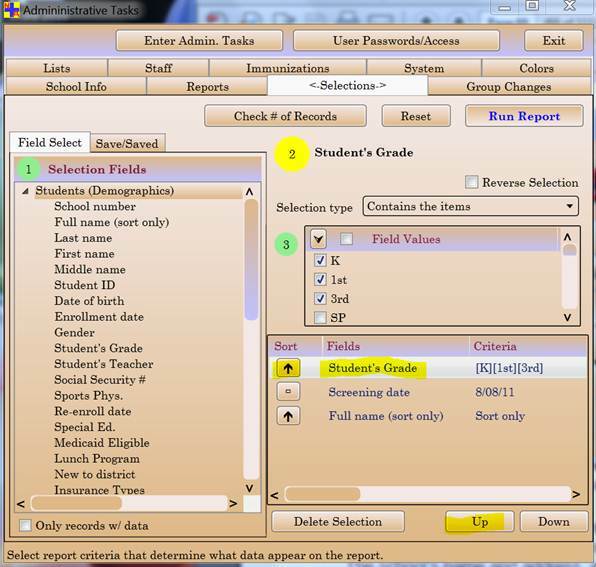 HOW DO I save selection criteria for a report? HOW DO I use e-mail to send out reports? HOW DO I include (embed) specific data in a form or letter? HOW DO I document administrative tasks? HOW DO I use the To-Do clock? HOW DO I set up for the Medicaid Billable report? HOW DO I run the Nurse's Time (Range) report? HOW DO I: enter medications for a student? 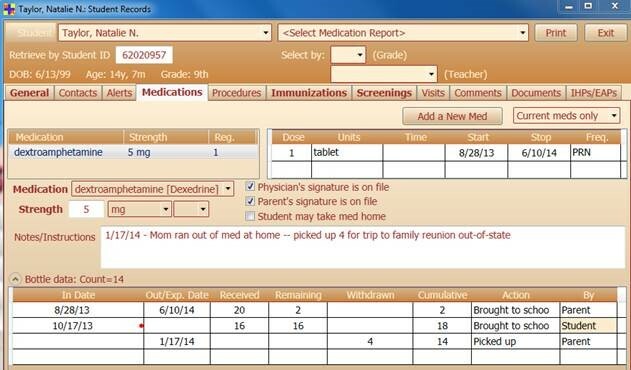 Student Information – bring up the student's record and click on the Medications tab. Click on Add a New Med and find the med in the drop down list next to Medication. Fill in the highlighted fields for that med related to Strength, and then the Dosage in the grid in the upper right portion of the tab. 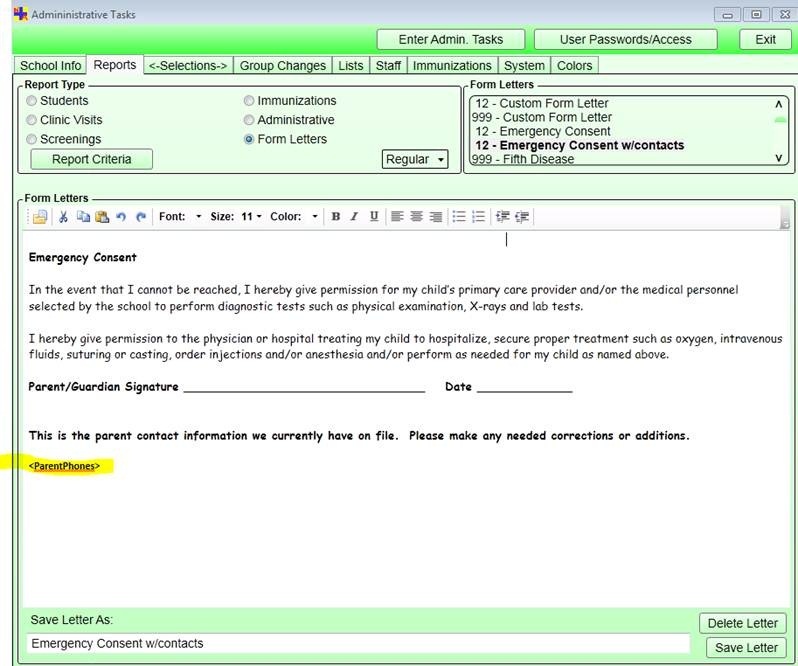 Any other informational fields such as whether the Parent's signature is on file or the Notes/Instructions can be entered, but are not required. If the med is something that can be counted (tablets, capsules, teaspoons etc. ), in the Bottle data data area, enter the date the med was brought in ( In Date) and the number Received. Other informational data in this grid such as the Out/Exp. Date can be entered, but are not required. Note however that expiration dates are honored in the Meds and Procedures form and will not be allowed to be administered after the date entered. As meds are administered to the student, the number in the Remaining column should be reduced and should always reflect the actual count < for that bottle. Having done the above, save the record either by double-clicking on the 'Student' label in the upper left portion of the window or by exiting the record. This student's medication should now appear on the Meds and Procedures form where it can be quickly and easily recorded when the child comes to your clinic. If this med is set up as a PRN, then in order to see it on the Meds and Procedures form you must check the box that allows displaying PRNs. When your supply of a child's med is running low or completely out, you may receive another batch which you will want to document on the student's Medication record. Simply click on Allow Changes and an additional blank line will be added in the Bottle data area. When you enter the number received the Count should be updated. Similarly, if a parent wants to take away meds, you would click on Allow Changes and then enter the date they were taken in the Out/Exp. Date column and the number taken in the Withdrawn field. Again, the Count should be re-calculated for that med. If for some reason the initial count (Received) was entered incorrectly, you may adjust this amount by simply retyping the number in the Received column. You will also be given the opportunity at that time to enter the number remaining in the bottle, since there would be no other way to adjust this number. Other pill count adjustments should be made by either adding or withdrawing pills on separate lines of the Bottle data grid. These adjustments should include the reason for the adjustments. HOW DO I: set up protocol medications? Let’s say you have throat lozenges in your clinic which you want to be able to give to any of your students. We refer to medications of this sort as 'protocol meds'. To set up throat lozenges as a protocol med, go to Administrative Tasks and click on the tab called Lists. 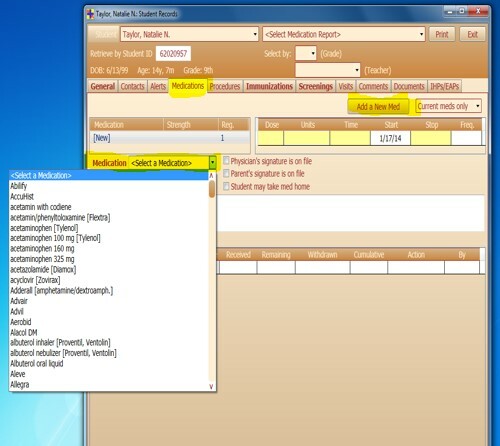 In the left column click on Medications. 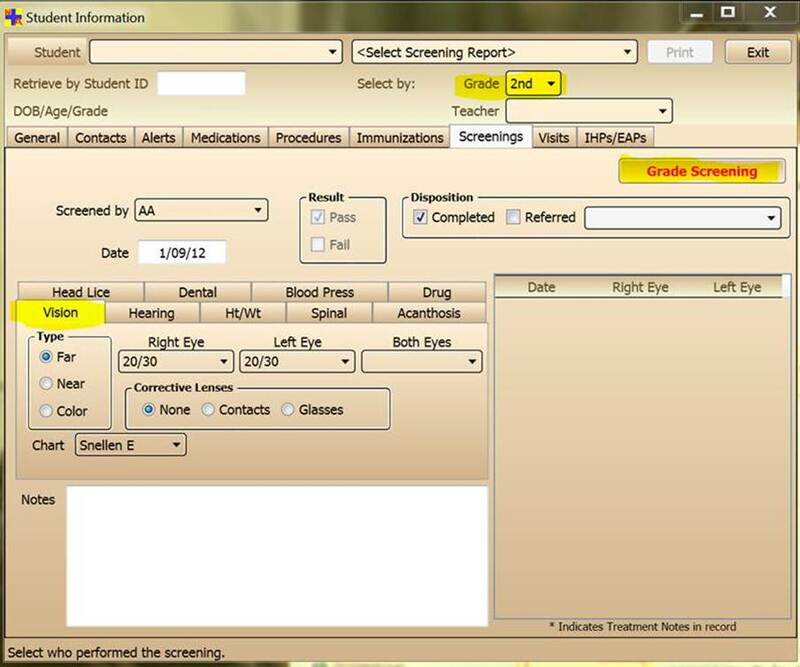 Near the lower left corner, click on the drop-down arrow and chooseProtocol med. There is a second step which determines whether you will see these protocol meds listed for each student during a clinic visit. Again in Administrative Tasks, click on the Lists tab. This time click on the Values radio button above the list on the left. In the list on the left, click on Protocol Meds. Now in the middle column, click on the top question: List only if OK? ". You have a choice of 'Yes' or 'No'. 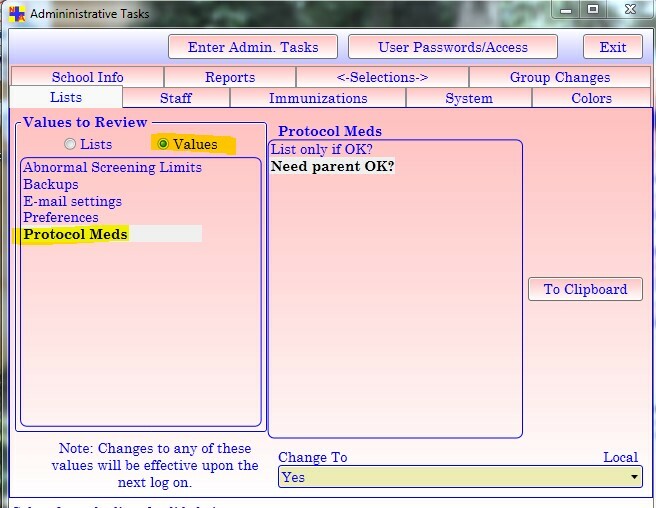 If you choose 'No', you will see all of the protocol meds listed for each student (and be allowed to show whether you have documentation for giving the med). If you choose 'Yes', you will only see the protocol meds for students who have turned in a permission slip authorizing you to give that med. Our recommendation would be to choose 'No'. For the second question: Need parent OK?, the answer will probably be 'Yes', indicating that the parent/guardian needs to provide an OK for you to give that med. 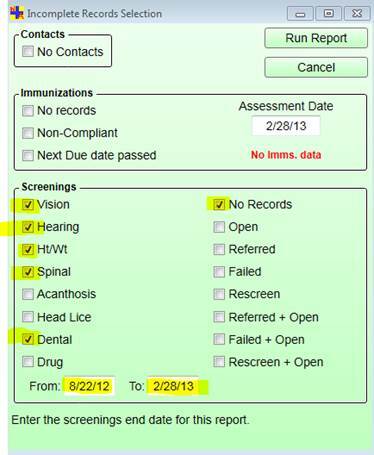 HOW DO I: create templates for clinic visits? Surely you have some clinic visits that occur frequently and repeatedly - - think complaints of headache, stomach ache, sore throat etc. Or you have visits for which you want to be sure you are covering all possibilities –- think head injury. It’s easy to set up templates for these conditions and/or situations. There are actually two ways to set these up. The first is to open a visit for a student with the type of visit for which you want to make a template; for instance, here’s how to create one for a headache. 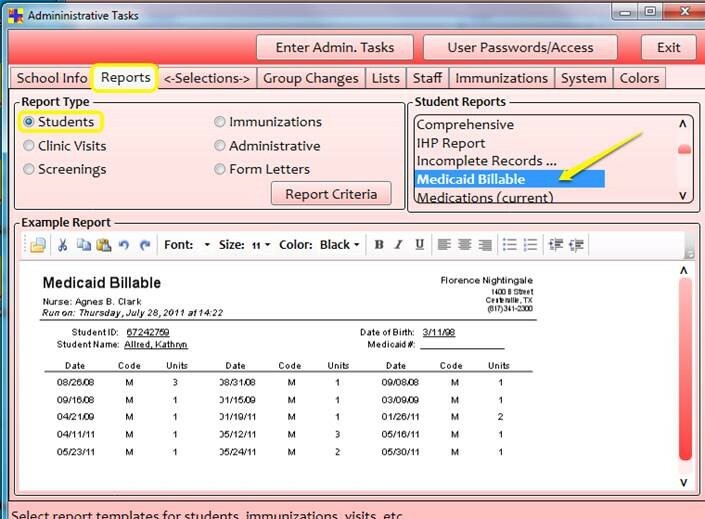 Check off applicable choices in the lists on the General, Assessments and Interventions tabs. To the right of the Save as >> button, give your template a unique name, and then click on the Save as >> button to save the template. at the top of each list. You can then individualize the visit by choosing the appropriate items for that child/visit. Of course you can also make additional choices from these lists at the time of the visit. 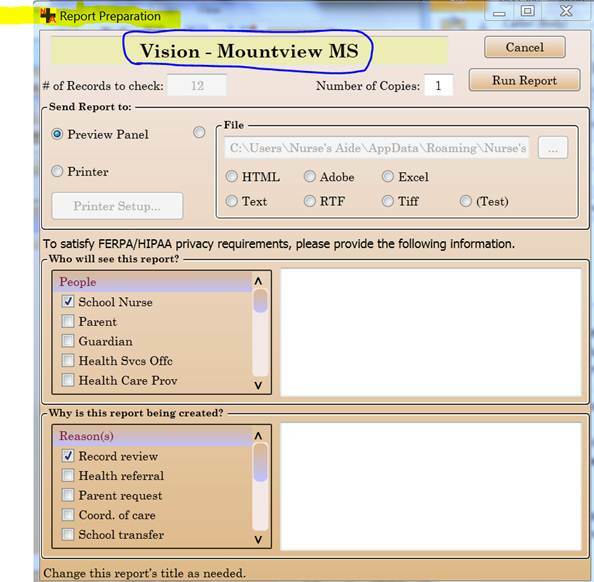 An alternative way of setting up templates is found on the Record Visit tab within Clinic Visits. The process is similar to that described above, but does not involve actually using a real clinic visit. In this case you just fill in the choices you want and save them under a unique name. 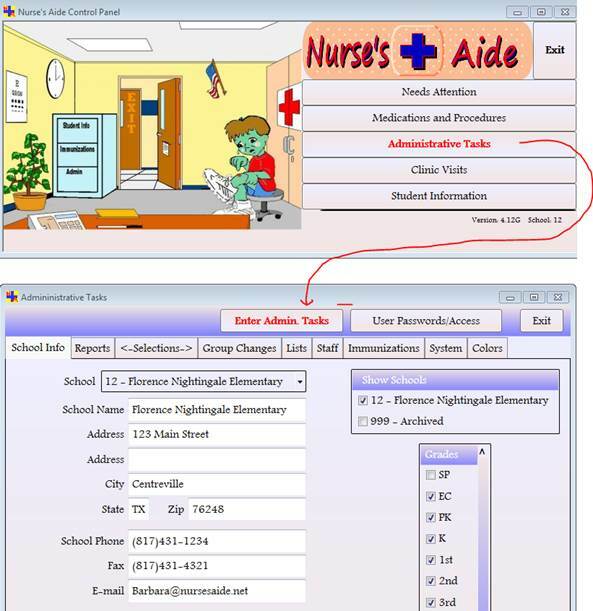 This is the only way an administrator can set up a template, since administrators can’t edit clinic visit records. If needed, you can change or add to what has already been set up for you in each template; make changes and be sure to click on the Save as >> button. Using the templates will not only save you some time and keystrokes, but possibly serve as a reminder of all that you should be considering for documenting each visit. HOW DO I: input screening results for a group of students? Go to Student Information / Screenings (tab). 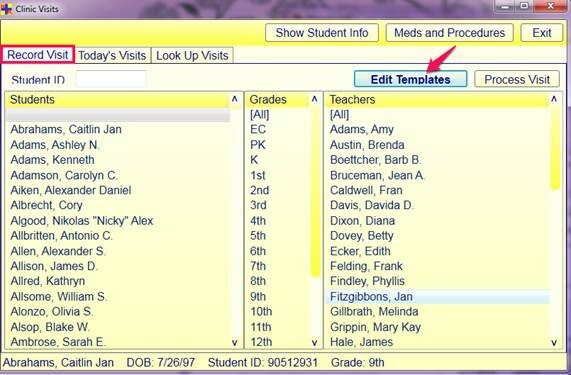 You can enter a single screening by bringing up the student’s name, choosing the type of screening and then clicking on the New button and entering the data. But you can also enter multiple screenings for an entire grade level or a particular teacher’s class. 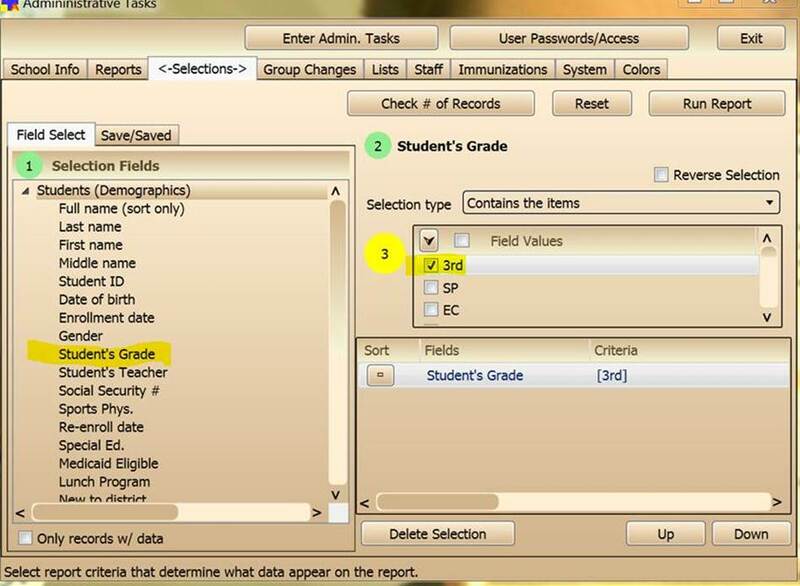 For a grade level, click on the drop down arrow next to Grade (top of form) and then choose the grade. Fill in the fields on the rest of the tab for that screening. Next click on the Grade Screening button. Note: while most users will do this for all the students who passed the screening, some users have come to realize that you can fill out the data in a way that comprises the results for any group of students. So, if you have a group of students that all have the same results, you can enter them all at once using this technique. 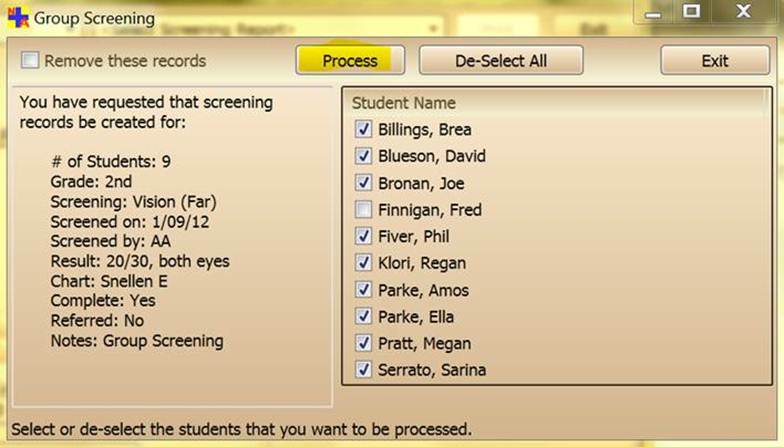 On the new form that is shown, uncheck any students whom you didn’t screen or who do not match the screening values entered. Simply clicking on Process will enter the results for the remaining (checked) group of students. Then go back to the individual students who were not included in the group screening checked list and enter their results one at a time. To do a group screening for a teacher’s class, click on the drop down arrow next to Teacher (top of form) and then choose the teacher’s name. From here, proceed as with a grade screening. Have you found the template that might be helpful for recording screening results? 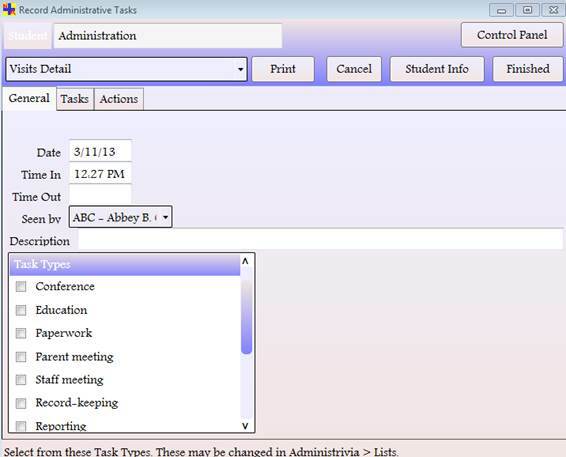 Go to Administrative Tasks / Reports (tab) / Students (radio button) / Screening Template. 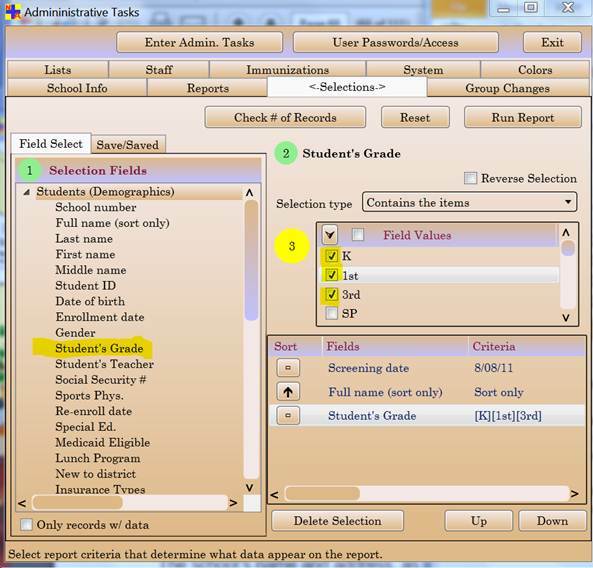 Then go to Selections (tab) and choose the Student’s Grade that you are screening. You’ll get a list of the students in that grade and a place to put their screening results; then you can enter those who have identical results, by screening type, as a group in your Nurse’s Aide program. HOW DO I: find students without screenings? The task is to get a list of all students who are missing one or more screenings; here are the steps to get an Incomplete Records report. Optional: you might want to choose Student’s Grade Grade as a selection criterion. Click on Run ‘Incomplete Records…’ Report. And then click on Run Report. You should get a report with data similar-looking to this. HOW DO I: send out screening notices to a group of students? The first step is to be sure the Screening Notice that you want to use is set up and listed as first in your list of all screening notices. Go to Administrative Tasks / Reports / Form Letters / Screening Notice . On the right under Form Letters, choose the notice that you want to use. Note: If the notice you have chosen is NOT at the top of the list, add an 'A' in front of it (and then click on Save Letter) so that it will be put at the top of the list. That is what determines which notice will be used when you are sending it out to a group of students. If you want the notice to include the child’s screening results data, add the <ScreeningData> tag (exactly as shown). Now, select the report that will print this notice. 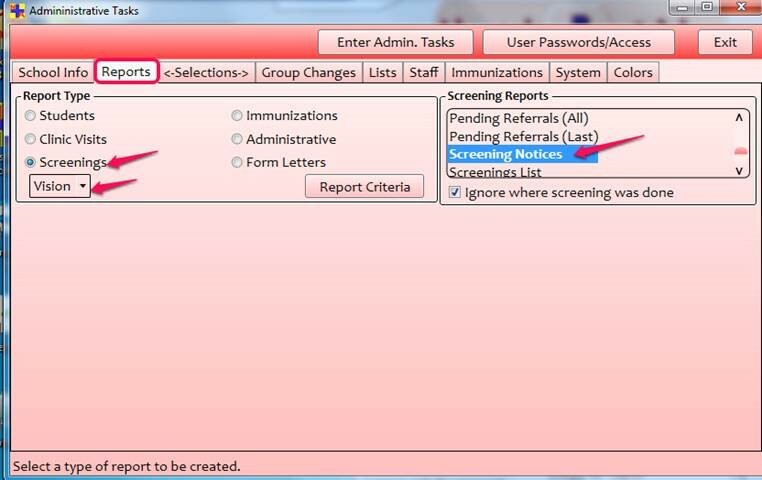 To do that, on the Administrative Tasks / Reports tab, click on Screenings and below it, the type of screening. On the right, choose Screening Notices. The next step is to select the students to whom this notice will be sent. Click on the Selections tab. Here you can select which student screenings you want to see. For instance, you may want only the screenings done this year, in which case you would click on Screening date and then on This school year . You’ll also probably want to select by those screenings which you referred for follow-up. Upon clicking on Run 'Screening Notices' Report and then on Run Report again, you’ll first see a list of the students for whom your notice has been generated. When you move it out of the way, you’ll then see the individual notices for those students. HOW DO I: get screening results and reports? 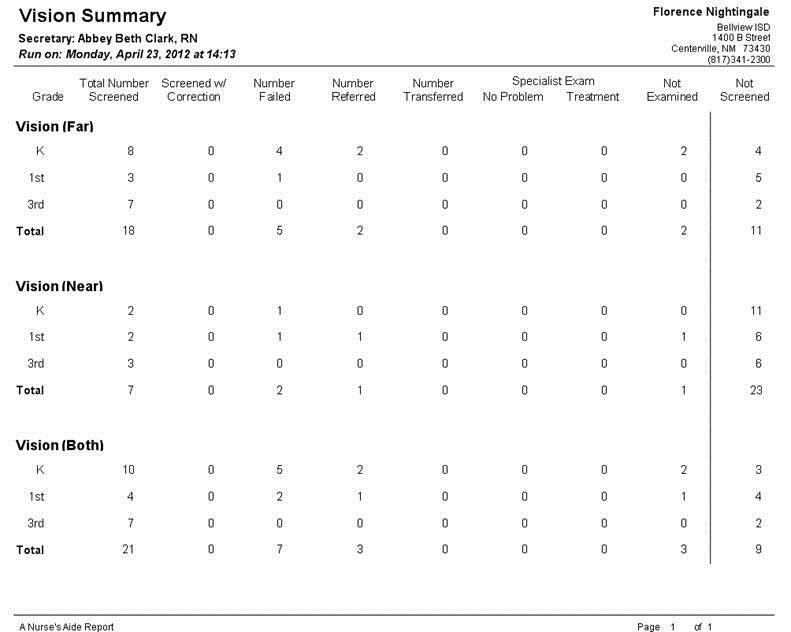 There are many screening reports to choose from in your NA software, but I’ll go over a couple here, which should then give you confidence to experiment with the others. Once your measurements have been entered, either individually or as a group, you might first want to check to see if you’ve missed anyone. Let’s use Vision, for an example. Click on the tab for Reports. Click on the radio button for Screenings. Just below, choose Vision from the drop-down list of screenings. 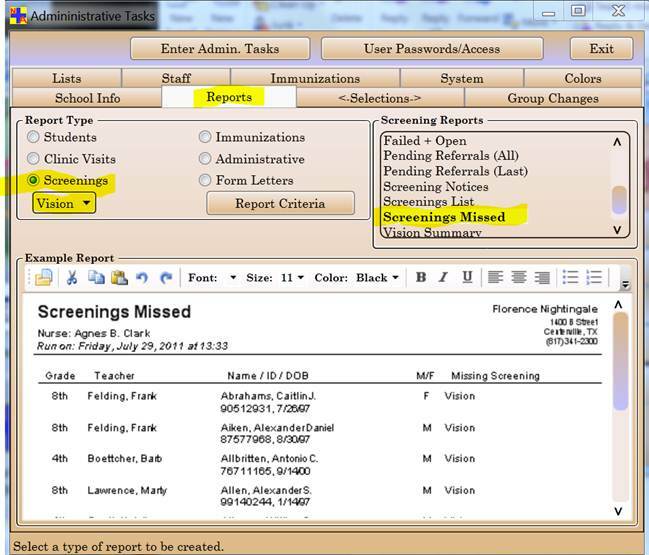 On the right, choose Screenings Missed (you may be able to see an example of this report in the lower half of the screen). Click on either Report Criteria or the Selections tab (they both take you to the same next screen). 2) Full name (sort only) which will put the student names in alphabetical order. Left this way, students in all 3 grades would be listed in alphabetical order. Let’s say, however, that you’d prefer to have the students first ordered by grade, and then alphabetically within each grade. To get that, click on the Student's Grade line and then click on Up until Student’s Grade is at the top of your list. Then click in the box in the column under Sort so that an arrow appears, designating either ascending (up arrow) or descending (down arrow) order. 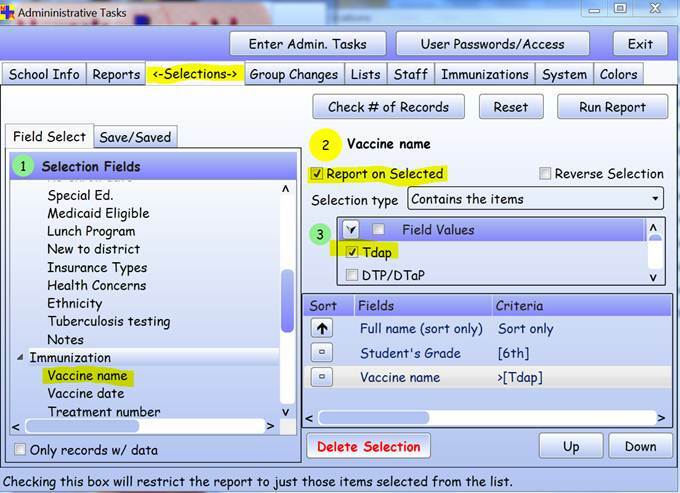 From here it’s easy to retrace your steps and this time choose another type of report for the same group of students. This time you might want to look at the All Referrals or the Failed (Last) report. To do that, go back to the Reports tab and choose the appropriate report on the right. Go to the Selections tab. Since you have not changed them, the criteria selections should be the same as they were for the last report. Keep in mind that you will always get a preview of the report, so it won’t hurt to play around until you find the report that will give you what you’re looking for. 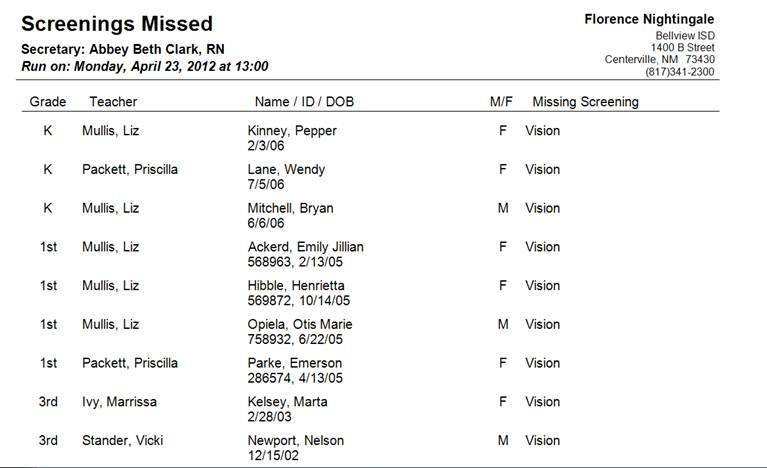 You might want to look at the Vision Summary report – it will give you several types of totals (rather than individual student names) for the screenings you have done. 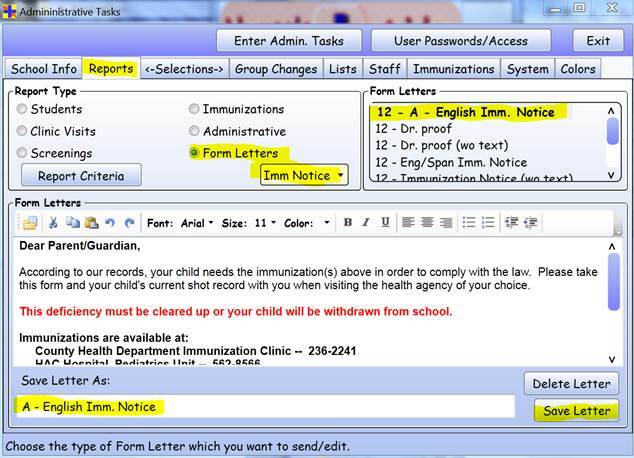 HOW DO I: send out immunization notices to a group of students? 5. In the Assessment date field, enter the date that school will start in the fall (or any other future date by which you want to see students who will need the vaccine). Note: to make sure this is considered by the program to be in the next school year, it must be at least one year after last year’s school start date. 6. Click on Report Criteria, or the Selections tab (they go to the same place). 7. On the left, click on Student’s Grade and then on the right, choose the grade(s) that students are in now. In this example, you’d choose 6th which is the current grade of the students for whom you want to create the notice. 8. Again on the left, go down to the Immunization heading and choose Vaccine name. On the right, choose the specific vaccine; in this case it would be Tdap. 9. Here’s a very important step: check the box in front of Report on Selected. This will restrict the report to just the selected vaccine(s). 10. In order to see what criteria you have chosen, click on the circled 3, so that you can see the grid in the lower right corner. 11. Click on Run Report (twice). 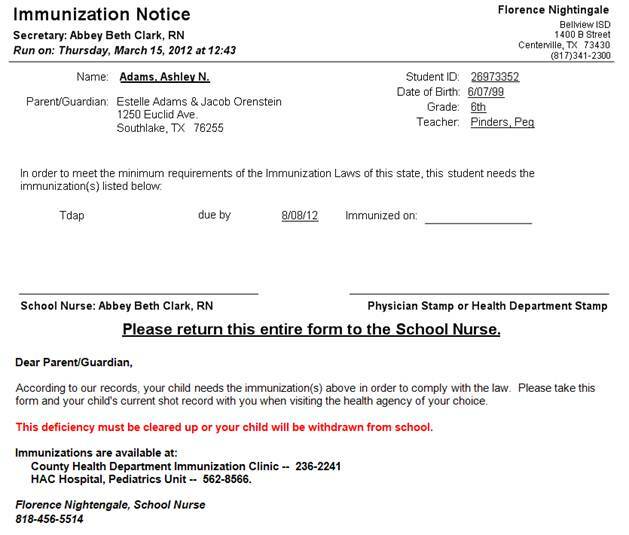 … and behind that, you’ll see an individualized Immunization Notice for each student along with the student’s shot record. Print the ones you want to send. Note: If you have more than one Imms Notice, the one that is at the top of your list will be the one that is used when you are creating a group of notices thru’ the above process. To be sure the one you want is at the top of your list, go to Administrative Tasks / Reports / Form Letters / Imm Notice . Pick the one you want and put an A in front of its name so that the program will recognize it as the one at the beginning of the alphabetized list and use it for the group notices. Be sure to Save Letter before exiting. HOW DO I: save selection criteria for a report? If you have the need to create the same report repeatedly, for instance at the end of each month, you might find it useful to save the criteria that you need for that report. You can now do that with a new tab found on the Selections tab within Clinic Visits. For instance, here I am setting up to run a Visits Summary Report in which I want to include all the students who have been in for any of four types of visits during the month of October. Knowing that I am going to have to run this report each month, I can click on the Save/Saved tab (to the right of Field Select), give this report a name and retain these criteria for the next time I run the report. 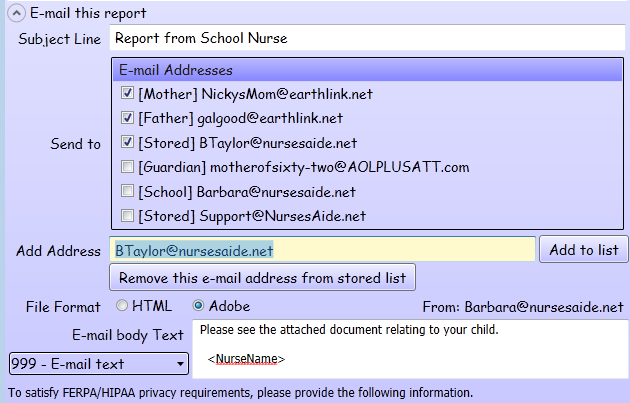 HOW DO I: use e-mail to send out reports? 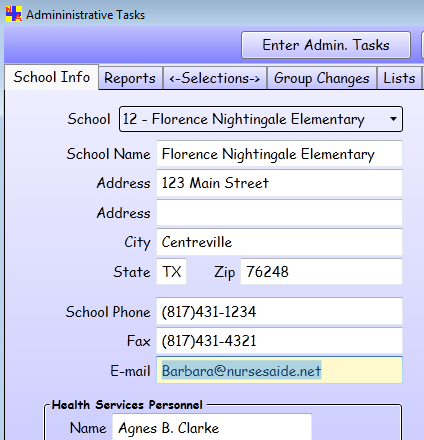 While it has been possible for a long time to create report files from within Nurse’s Aide that could then be sent as attachments to an e-mail, we have made that process a lot easier. 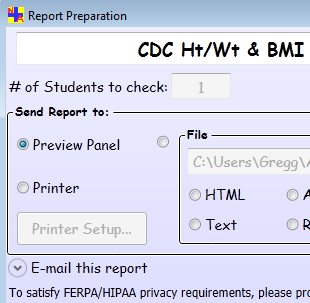 It is possible to send an e-mail directly from the report preparation form. This document explains how you can enable this facility as well as things you need to keep in mind when using it. First of all, the reason this was not immediately available in our program is due to privacy concerns. We didn’t want to allow users of our program to indiscriminately send our any report to anyone. That could be a disaster. But after thinking about what we could do, we decided that we could allow the user to send out reports that only had to do with a single student. Of course it is still possible to send out a record containing Johnny Jones’ visit data to Jimmy Jones’ mother, but the chances of that are not too great, and the user will need to assume responsibility for that. This information can be provided by your tech person or your IT department. This information is used to actually communicate with your e-mail provider. If it is incomplete or inaccurate, the e-mails will not be able to be sent. Since the people to whom you will be sending e-mails may want to respond to you, it is important that you put into this field the e-mail address that you want to use for such communications. When you are presented with the opportunity to send out a report as an e-mail attachment (see below), all of the e-mail addresses for all of that student’s contacts are listed so that you can choose which ones are to receive the e-mail. As you can see, there is a line that will allow you to enter an e-mail address that is not already in the list. You can even save this e-mail address for future use. For example, you may want to include your school principal or nurse administrator on some correspondences. 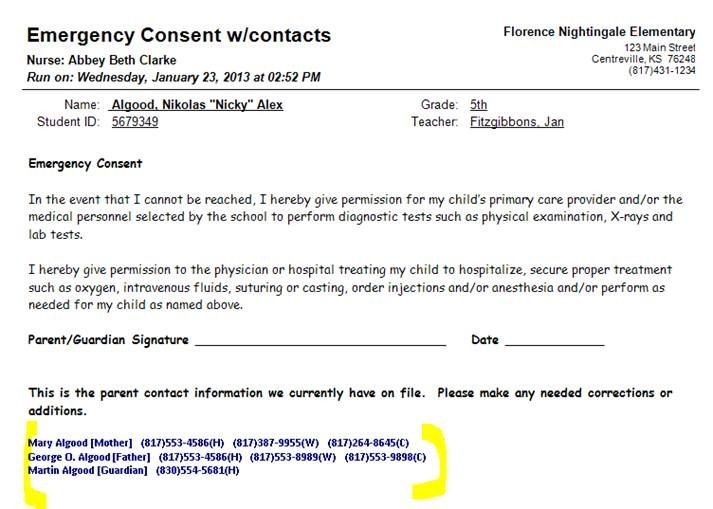 In the area labeled E-mail body text, you can select from a list of stored texts that you or your school district might create for various purposes (screenings, visits, immunizations, etc.). These are created and stored in the same place as form letters, namely Administrative Tasks > Reports > Form letters > E-mail text. However, even if you select one of these stored texts, you can still edit it at this point. You can edit these fields if you want to at this point. If you are happy with this e-mail, press the Send button to actually deliver the e-mail and attachment. HOW DO I: include (embed) specific data in a form or letter? 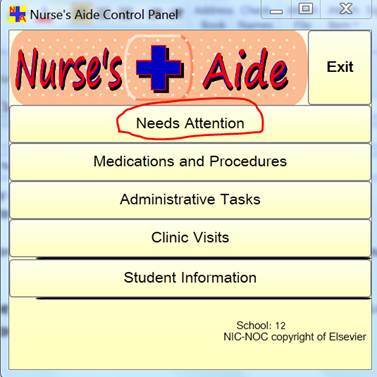 Of course you know that Nurse’s Aide is highly customizable in that you can design your own lists, forms, letters, reminders, templates and reports. What you may not have discovered is that you have the capability of embedding specific data in your custom forms and letters. 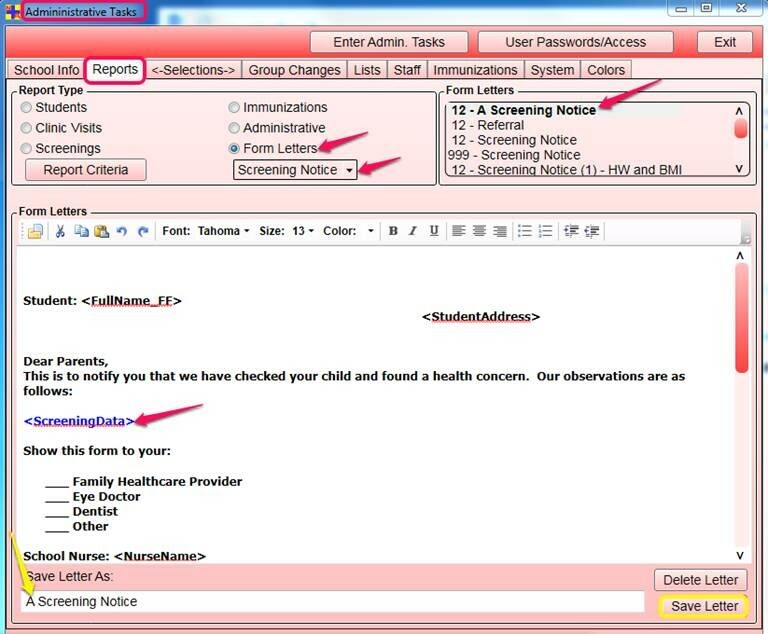 For instance, if you are sending a screening notice, you can personalize each one by not only addressing it to the child’s parent or guardian, but by also including the child’s screening results in the letter. And of course an Immunizations Notice could list what vaccines the child needs as well as a copy of their Immunizations Record. But did you know that other data can be inserted as well? This came up recently when a user requested that the child’s mother/father/guardian phone contact information be included in a child’s EAP. Notice how I can choose the color, font size and bolding that will be used. HOW DO I: document administrative tasks? Did you know you can document in Nurse’s Aide how much time you spend on various responsibilities that aren’t directly related to student/staff visits? Tasks such as ordering supplies, attending meetings, paperwork, conferences with parents or staff, training etc. may take up a surprising number of minutes (hours?) in your day. It’s easy to chart these duties and easy to run a report on them when needed. On the next screen, choose from the list of Task Types. (This is a customizable list, so if what you need isn’t there, it can be added by going to Administrative Tasks / Lists / Administrative Tasks). Go to the Tasks and Actions tabs if you want to add specific details about what was done. HOW DO I: use the To-Do clock? 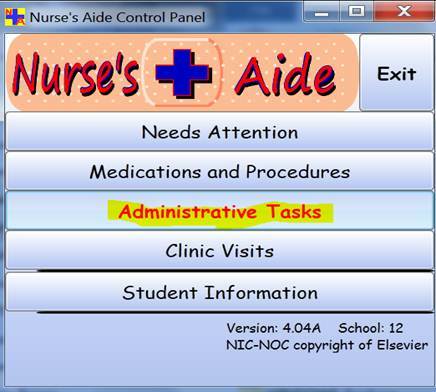 Upon opening your Nurse’s Aide program, the first screen you’ll see is the To-Do Clock screen. Besides some helpful reminders, you’ll see the smiley face clock which does tell you the time – here it shows that it’s 9:39. But if you don’t think he’s as cute as we do, you can erase him by going to Administrative Tasks / Lists / Values / Preferences / Show clock on To-Do form / No. Meds -- you’ll see any medication that is either low (down to 10% of the original Received amount) or about to expire. 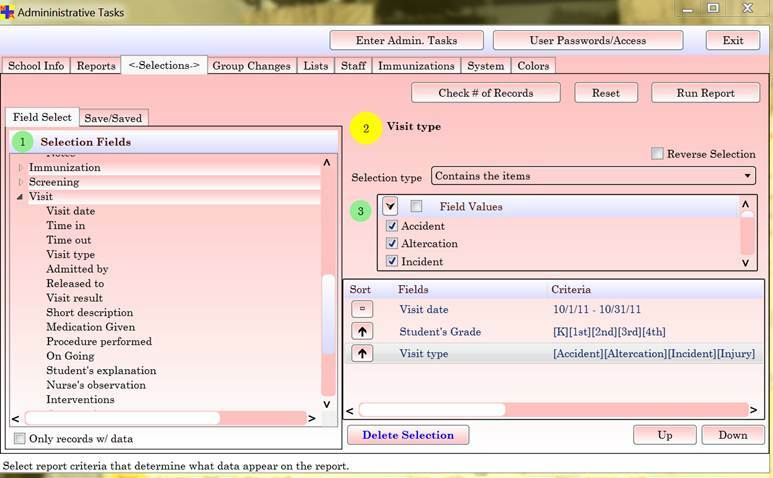 Visits -- you’ll see any visit on which on which you have clicked the On-going check box in order to be reminded to follow-up on a visit. Screenings -- lists any screening which are not Completed. To-Do -- allows you to create your own custom reminder for yourself. For each item listed on all tabs, simply clicking in the box on the left will take you to the screen where you can make changes as needed. When you’re done with the To-Do list, you can close it, and always come back to it by clicking on Needs Attention on the Control Panel . HOW DO I: set up for the Medicaid Billable report? 2. Marking the records is done within Clinic Visits. Open and chart a visit as usual, being sure to click on the choice of 'Medicaid Billable' on the Assessments tab. 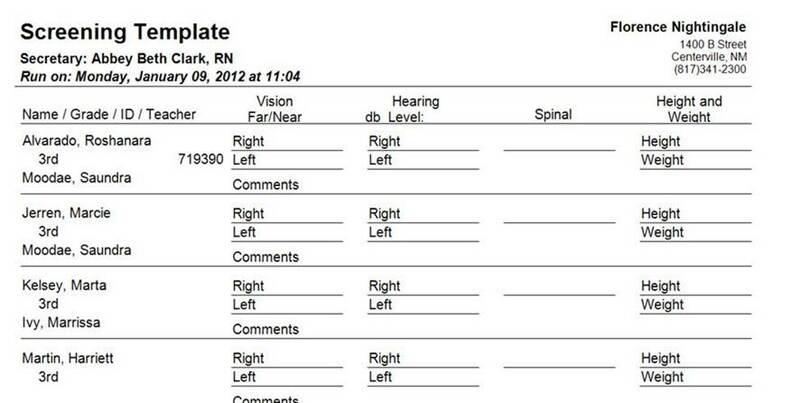 That’s all it takes to make that visit appear on a Medicaid Billable report. Go to Administrative Tasks / Reports / Students / Medicaid Billable. Then on the Selections tab, you can choose criteria (such as date range) to determine your report results. 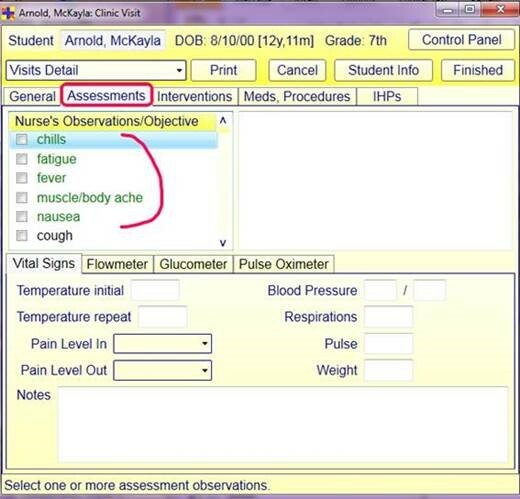 On the report itself, the 'M' indicates that a student came in and was given a medication. The number of units indicates the number of medication visits on a particular day. The 'I' indicates any visits in which a medication was not given on a particular day. If there was a med given on that day, there will not also be a visit recorded as well. So for any given date there could be either an 'M' or and 'I', but not both. The 'I' only appears if there was a non-med visit and" there is not an 'M' for that date. The number associated with the 'I' is the number of 15 minute intervals that the student spent in the clinic. For instance, 1:01 (one hour and one minute) would yield 4, 1:08 (over half of 15 minutes in the last interval) would yield 5. A visit lasting less than 8 minutes will not show up on the report (the name appears but there is no notation under it). 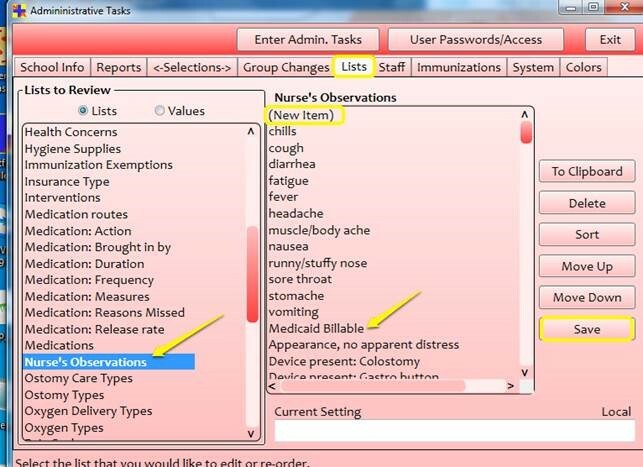 HOW DO I: run the Nurse's Time (Range) report? Recently a nurse called with a request for help with an interesting question. She wondered if there was a higher frequency of visits to her clinic during the days of state testing. So she wanted to compare a specific span of time (preparing for and taking the test) with a same span of days both before and after the testing weeks. She was using our Nurse’s Time report but was having trouble getting the specific dates she wanted. So we added another report that not only allows for easily entering dates, but also gives the number of visits and number of minutes that were spent in visits from teachers and other staff. To compare this report with other dates, simply go back to the Selections tab and change the dates.